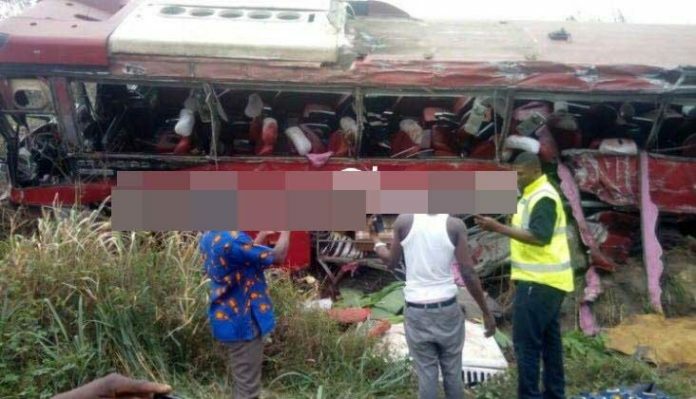 Reports coming in has it that personnel from the Ghana Police service who were at the Kintampo accident scene are alleged to have stolen an amount of Ghc 18,000 belonging to one of the victims. According to the survivor of the accident, he had a huge sum of money with him during the accident which he now cannot find and all effort to locate his money has proved futile. Aziz Mohamed, the survivor, speaking to Adom Fm’s “Dwaaso Nsem” revealed that on that fateful day he had Ghc 18,000 with him whilst traveling to buy some goods for his business. According to Aziz, he was informed that the bag containing his cash was with the emergency services who came to the scene, either the police or fire service, but both agencies have been ‘tossing’ him around. “I asked the Police and was told it was with the Fire Service but when I went to the Fire Service, I was referred back to the Police who insist they don’t have it,” he said. As at now, it’s not clear if the bag is really with either of the two services or it did not survive the accident, but if they don’t have it there’s no need to keep tossing him around. There’s also the dreaded possibility that the bag was found and is being kept from Aziz. Aziz also added that he lost two brothers plus four phones in the same accident and he needs his cash to get his business back on track.